Originally from Raleigh, North Carolina, Sean Devlin moved to Greensboro where he earned his Bachelor of Music degree from the University of North Carolina at Greensboro. He continued his education at the University of North Carolina School of the Arts where he earned his Master of Music degree in Trombone Performance under James Miller. 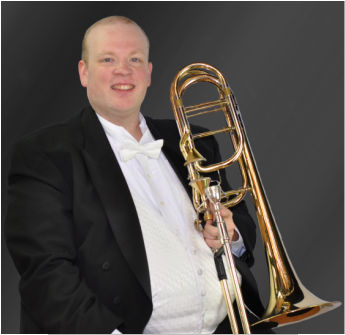 Sean is currently the bass trombonist of the Carolina Philharmonic, the Salisbury Symphony, and the North Carolina Brass Band. He is a founding member of the Ardmore Brass Quintet and has performed with various brass and chamber music ensembles throughout the state. He has also performed with the North Carolina Symphony, Chamber Orchestra of the Triangle, Winston-Salem Symphony, and Greensboro Symphony. In 2002 Sean won the position of principal trombone in the annual National Wind Ensemble, hosted at Carnegie Hall. In the summer of 2003, Sean was the principal trombonist of the Catania International Festival orchestra in Catania, Sicily. He has twice been a finalist for the International Trombone Association's Lewis van Haney competition and is a past winner of the UNCG Concerto Competition. In addition to playing the trombone, Sean is a bagpiper with the Jamestown Pipes and Drums based out of Jamestown, North Carolina.